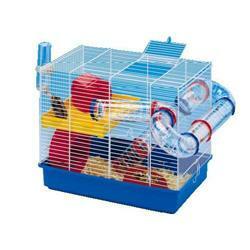 You may opt for a basic cage which is sold in pet shops whose design consists of a plastic base and rigid wire top. These cages come in a lot of shapes and sizes and are easy to clean. Cedar Shavings can cause the hamster allergic reactions. Pine shavings are preferable to Cedar but paper based shavings are the best used. Straw should not be used as this could be sharp and could cause injury to the hamster’s eyes or cheek pouches. Hay, toilet paper or shredded paper is best. Syrian Hamsters appreciate these and Dwarf Hamsters will adore paper based bedding. Food bowls should be preferably earthenware as plastic could be easily knocked over and chewed by hamsters. Food bowls should be refilled daily. A drinking bottle supplies water to your hamster in the best way as it ensures a good supply of clean water. Drinking bottles with a ball-bearing in the tube are best as these are less inclined to leak. The most hamster water bottle that I found useful is 'Karlie Snuggel Bar' - this hamster water bottle does not leak. Hamster drinking bottles should be cleaned at least once a week by watering the bottle and having a cotton bud to clean the gab between the bottle and the opening. The water in the water bottle, should be replaced every day to guarantee fresh water to the hamster. Solid wheels are best, runged wheels can have a strip of cardboard weaved through the rungs to avoid a hamster’s feet slipping through. Wheels can squeak after a while and this can be avoided by placing a drop of vegetable oil on the axle. Hamster wheels provide an excellent means of exercise for the hamster. 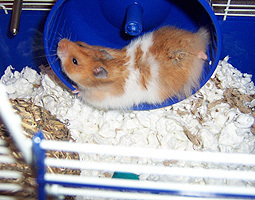 Most hamsters use the hamster wheel at night since hamsters are nocturnal. Some hamster wheels can make squeeking noises and this can be solved by putting some olive oil at the back of the wheel ie:where you stick the wheel to the cage. In this way, the squeeking noise will dimisnish. Hamster Balls are clear plastic with an opening in which the hamster can be placed. The hamster ball is then shut and the hamster can run, moving the ball around the house. These are a safe way for hamsters to run around the house and prevent a loose hamster from escaping. If your hamster does not enjoy the ball, then do not force it and find something else that your hamster will enjoy. Furnishings include plastic houses, climbing blocks, wooden / plastic ladders, hamster see-saws, hamster tubes etc. Also the cage can be furnished with things such as toilet roll tubes, small branches of apple wood will also give the hamster something to climb on as well as to gnaw. Check out this hamster article about hamster homemade toys.